Asthma is a serious disease and should be discussed with your doctor. You may need an inhaler to deliver an immediate metered dose of medication. But there are effective natural treatments for asthma, along with herbs and natural supplements for asthma treatment. These may help to reduce the frequency and severity of your asthma attacks, and help manage the debilitating symptoms when they happen. The disease causes recurring periods of wheezing, chest tightness, shortness of breath, and coughing, which happens most often at night or early in the morning. It’s all too common a condition and can take hold at any point in your life, but it most often starts in childhood. More than 25 million Americans are known to have asthma, and about seven million of them are children. Wheezing: Wheezing is a whistling or squeaky sound that happens when you breathe. 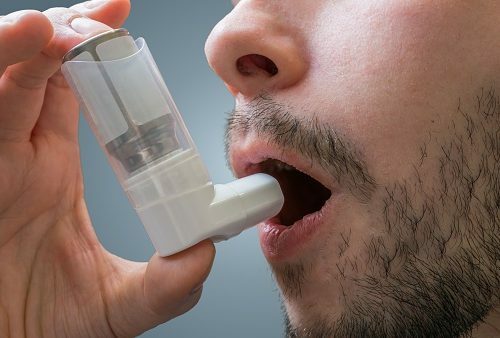 Shortness of breath: Some people who have asthma say they can’t catch their breath or they feel out of breath. You may feel as though you can’t get air out of your lungs. But not all people who have asthma have these symptoms, and having these symptoms isn’t a definitive indicator that you have asthma. You need to see your doctor for a lung function test, a medical history, and a physical exam. The sad news is, asthma is incurable. So if you’re looking for the best natural cures for asthma, you won’t find them. There is no magic herb or treatment that will clear your airways for good. But there are effective home remedies for asthma to try. Remain calm: When an asthma attack strikes, panic can make your symptoms worse. You need to take a moment to try to relax. Close your eyes and visualize your lungs expanding and filling with white light, and feel your breathing become easier. Then repeat a few times before opening your eyes. Try caffeine: If you feel an attack coming on, drink a strong cup of coffee, tea, or two cans of caffeinated soda to help open your airways. Caffeine is chemically related to theophylline, which is a standard medication for asthma. Eat more bright-colored fruits and vegetables: Bioflavonoids are the compounds that give fruits and vegetables their wonderful hues. These compounds have powerful anti-inflammatory and anti-allergenic properties. Start eating a rainbow of fruits and vegetables at every meal! Keep a food journal: Make a note of everything you eat for a month and record your symptoms. Food allergies could be connected to your attacks. Try to determine if any food could be triggering the frequency or severity of your asthma symptoms. Try acupuncture: This therapy, used in traditional Chinese medicine, places fine needles in strategic points on the body to promote self-healing. It’s used to treat many conditions, and may help to ease the symptoms of asthma. Evening primrose oil: This natural oil from the seed of the evening primrose plant is rich in essential fatty acid. It’s commonly used to treat skin problems but it may help promote open airway passages for easier breathing. It’s available in capsule form. Lobelia: Also known as Indian tobacco, it was used by Native Americans to treat respiratory disorders, including asthma. Mullein: This easy to grow herb is also that common sidewalk weed you’ve seen on vacant lots and overgrown yards. The leaves are pale green and fuzzy. You can find it as an herbal tea for respiratory irritation. Its known as antimicrobial and antispasmodic for coughs. Black seed: Black seed is a plant. People have used the seed to make medicine for over 2,000 years for headache, toothache, nasal congestion, and intestinal worms. It was even discovered in the tomb of King Tut. More modern medicinal uses include digestive tract conditions and respiratory conditions including asthma. Pycnogenol: This is the registered trademark name for a product from the bark of a tree called Pinus pinaster. Pycnogenol contains substances which may stimulate the immune system and improve blood flow. While you may require prescription medication for your asthma, these natural treatments for asthma can help lessen the severity and frequency of your symptoms. Remember, asthma is different for each person. Different triggers may set off an attack. With these home remedies for asthma on hand, you can help make life just a little easier.